Now that we’ve created and published our first piece of web content for Nose-ster, it’s time to display it. First, add the Web Content Display portlet to our Welcome page by selecting Add → Web Content Display from the Dockbar. Once the portlet appears, drag it to the position on the page where you want your content to appear. You can have as many Web Content Display portlets on a page as you need, which gives you the power to lay out your content exactly the way you want it. 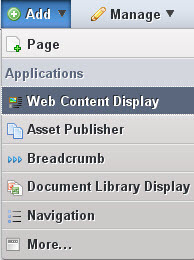 To add existing web content, select the gear icon on the lower left of the portlet. You will see the message Please select a web content from the list below. You have several options here. Naturally, if your content appears in the list, you can simply select it. If there is lots of published content available, you could search for the content by name, ID, type, version, content and site (click the Advanced link to see all the options). You can also show the available locales for your content. If you’re working on the page for a particular language, you can select the translation of your content that goes with your locale. Figure 2.19: Publishing web content is a snap. At a minimum, you only have to select the content you wish to publish. You can also enable lots of optional features to let your users interact with your content. If you have enabled OpenOffice.org integration with your portal, you can also enable document conversion for your content. This gives your users the ability to download your content in their format of choice. This is especially handy if you are running a research or academically oriented site; users can very quickly download PDFs of your content for their research projects. Note that you also have other options, such as enabling a Print button, enabling ratings so users can rate the content, enabling comments and enabling ratings on comments. The Print button pops the content up in a separate browser window that contains just the content, without any of the web site navigation. This is handy for printing the content. Enabling ratings shows one of two ratings interfaces Liferay has: five stars or thumbs up and thumbs down. This can be set globally in the portal-ext.properties file. See chapter 12 for further information about this. Enabling comments creates a discussion forum attached to your content which users can use to discuss your content. Enabling ratings on comments gives your users the ability to rate the comments. You may decide you want one, some or none of these features, which is why they’re all implemented as simple check boxes to be enabled or disabled at need. If you click the Supported Clients tab, you’ll see you can choose the type of client to which you want to expose content. This lets you target the large screens of users’ computers for expansive graphics and lots of special effects or target the small screens of mobile devices with pertinent information and a lightweight page. For now, leave both checked and click the Save button. 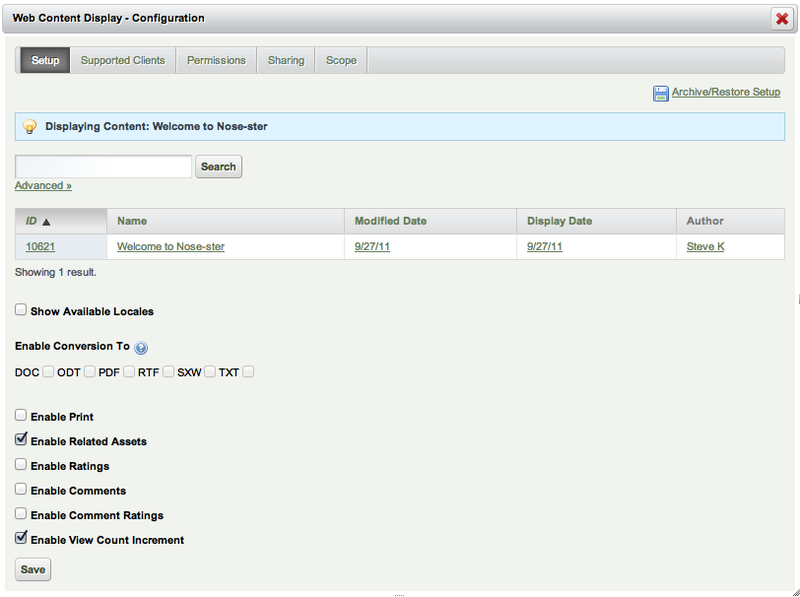 You can now close the configuration window. To publish new content, select the page and green plus icon on the lower left of the portlet. This launches the same full-featured editor you’ve already seen in the Control Panel, which lets you add and edit content in place as you are working on your page. This is another example of the flexibility that Liferay Portal offers. At times, you may want to add content directly into the Web Content Display portlet of the page you’re managing, especially if you are in the process of building the page. At other times, you may want to use the Control Panel to create content, because at that moment you’re more concerned with the creation of the content and not where the content will later be displayed. Liferay WCM supports both processes. Editing content that’s already been published is just as easy as creating new content is. You’ll use the same exact tools. Once the content is displayed–whether you’ve selected content or created it in the Web Content Display portlet–you can edit the content directly from the Web Content Display portlet or from the Control Panel. To edit it from the Web Content Display portlet, select the pencil icon to the lower left of the portlet. This launches the WYSIWYG editor and from there you can make any necessary changes. When you publish your content this way, it becomes available immediately (unless, of course, you have a workflow enabled, which we’ll see below). This happens whether you edit it in place or in the Control Panel. Note: if you want to view your page the way your users will see it (i.e., without all those portlet controls and icons), go up to the Dockbar and select Toggle Edit Controls. This makes all those extra controls you see as a portal administrator disappear. If you need to use those controls again, just select Toggle Edit Controls again. That’s pretty much all there is to simple content creation. Whole sites have been created this way. But if you want to take advantage of the full power of Liferay’s WCM, you’ll want to use structures and templates found in chapter 3. Next, let’s see how you can manage your content with an approval process called workflow.